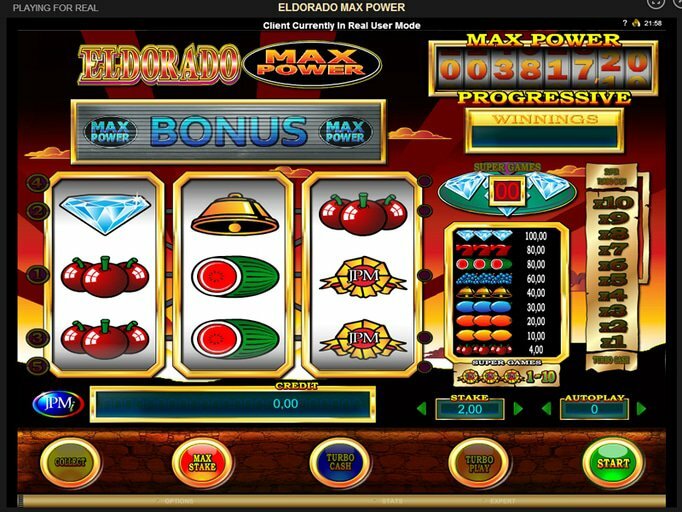 People who love the classics are going to fall in love with the Western-themed Eldorado Max Power slot machine from Microgaming. This is a three-reel, five-line title featuring cherries, bars and 7s that provides tons of unique opportunities to win. It's a little confusing at first with the buttons at the bottom of the screen, but you'll soon find out that it isn't confusing at all and it is in fact quite exciting. To get started, choose your wager which starts at a quarter and goes up to $1. Then, simply spin the reels! Three of the Rosettes across any of the paylines will trigger the Super Games feature that gives you up to 10 free spins, but there's a catch - if you manage to land a Diamond anywhere on the screen while they are progressing, you'll get 50 times the value of your bet! How's that for an incentive? Unfortunately, though, only the Diamond will win here and all others, including regular and progressive wins, are put on hold until it is finished. After any winning combination, you'll have the option to participate in the Turbo Gamble feature. With this, you'll see a ladder with multipliers that will move and stop on one to determine how much you win! You can collect a multiplier at any time, but if the selector reaches the bottom of the ladder at any time then you will forfeit your win. However, if it reaches the top, you'll participate in the Super Turbo Gamble that can either award you an additional half or even double what you've already won. When three Max Power symbols appear on a line, you'll win your share of a progressive jackpot, too! To check it out, head over to Go Wild Casino where you'll get some fabulous incentives such as Eldorado Max Power free spins, a 100% deposit match worth up to $200, and the Go Wild 50 free spins to use on titles like Tomb Raider, Avalon or even Thunderstruck II! What are you waiting for? There's truly nothing to lose but you have everything to gain if you get started right away!